Experimente Roma con todos sus sentidos en este delicioso tour de 4 horas de caminata y comida al atardecer en el distrito Prati de Roma. 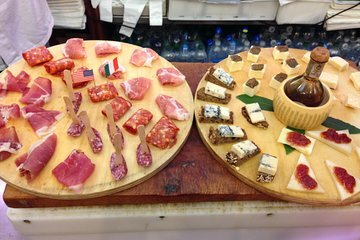 Conozca a Roma como un local, mientras recorre las calles de Prati con su experto guía local, visitando hasta cinco diferentes tiendas de alimentos gourmet para degustar hasta 20 alimentos diferentes. Entra en algunas gemas ocultas, mientras comes bocadillos y quesos curados, comes una pizza increíble y conoces a algunos de los fabricantes de alimentos artesanales que te darán recetas y consejos para preparar comidas. El tamaño de los grupos está limitado a 13 personas, así que reserve con anticipación para asegurar su lugar. Paseo nocturno de 4 horas por el distrito Prati de Roma. Muestra hasta 20 diferentes delicias romanas comestibles. Coma todo, desde pizza hasta queso y carnes curadas. Tour en grupos pequeños limitado a solo 13 personas, lo que garantiza una gran atención personalizada. Con este tour para grupos pequeños, pruebe hasta 20 alimentos diferentes, mucho más que el promedio. We had a fabulous tour guide, Memo, Domenico, who led us around town and had a fabulous personality for making people feel welcome. The sites that we visited were personable and served delicious food. Lot of walking to be expected. Lots of food. Lots of Wine. You will not be disappointed. The gelato shop was the best one with the best flavors that we found while in Rome. The introduction to pizza in Italy was amazing and set the tone for our entire trip, even convincing a gal in our party who does not like pizza, bread, or pasta. She ate all of it the entire time there. Lots of laughs, lots of great conversation. Our group of nine thoroughly enjoyed our food tour with Jess. The food and wine were amazing and there was an abundance of food! Jess was so knowledgeable and fun!! Don’t miss this one on your trip to Rome and ask for Jess! A side of Rome not often seen. Franchescia was one of the best: knowledgeable, a good communicator and well organized. She organized a speculator tour including an eclectic range of food experiences unique to Rome and Italy: cheese, truffles, rare basaltic, over the top pizza, pasta, and pasta. The wine sides were well selected. Absolutely fabulous. Jess was a great guide. Really knows her stuff. We ate, we drank,we laughed. Can't recommend this enough. Francesca was our guide and so delightful! I had looked to other tour companies who told me “a Prati food tour was not possible on Sundays because things were closed” - well due to their relationships certain shops opened solely for our tour group! So many fantastic items and amazing wine - we are big eaters and there was more then enough food. We stopped for cured meats, cheeses, an amazing pizza place, more cheese, fantastic pasta with champagne to celebrate both our anniversary and another attendees birthday....I can’t say enough things about how truly memorable this was. Will highly recommend to anyone who asks. Great variety of food - some better than others. The last restaurant where we had the pasta was not very good. the pizza place was phenomenal. I loved walking around the city. The tour could have ended 45 minutes sooner. Too many personal stories from our lovely tour guide. Loved it. Morgan is a great guide and the food and wine was delicious. One of the highlights of our trip. I really enjoyed the Rome Food Tour and Morgan was very personable and informative. The food was great. Way more than one person needs. The dinner and dessert were the best part. My daughter had gone on this tour back in May and highly recommended it me for my trip. Morgan was great. This is a must do as soon as you arrive tour. Gives you a sense of where locals eat. Fun meeting other couples and groups. Best pizza anywhere! The food tour was awesome and absolutely worth the money. We did an evening tour with the other couple we were traveling with and we had a great time! Our tour guide took us to some great restaurants, best pizza and taught us how to look for authentic gelato...which was well worth it as we were spending 10 more days in Italy. Our new tradition when traveling abroad is to do food tours and this was our second and we enjoyed it.